Cinnamonandzoeykisses: July Most loved items! 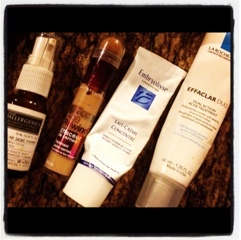 Besides empties posts (maybe even more!) my favorite posts to read has to be monthly favorites! They must be great products to make someone's fave list! In July I really did try to minimize my makeup (at least during the day/work time) but evenings and outings I still managed to spruce myself up, when needed! Onto my most reached faves for July! 1. NARS Sheer Glow Foundation (Medium- Barcelona)- I've already praised this but can still go on and on.. This foundation is seriously becoming my HG/love! It's simply amazing- from The coverage, the longevity, everything but the no pump! But again I love it so much I still see myself using this for a long time! 2. Embryolisse Lait-Creme- I first heard about this Creme from Pixiwoo. 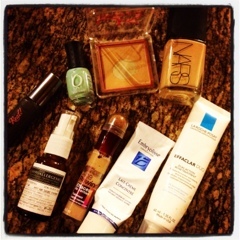 It's amazing how it sinks into the skin and is the perfect base to apply my foundation. This is my third tube and will always have a tube on hand! 3. La Roche Posay Effaclar Duo Acne Treatment- When Hormonal acne decided to pop up on my chin and a few on my cheeks, this came to be rescue! This really is amazing! A little goes a long way, when used to much for a long period of time it can cause some flakiness/dryness. I used it sparingly on just the needed area. 4. VMV Hypoallergenics Re-Everything Eye Serum- I received this in my first Birchbox in January (I've since canceled that subscription). I apply this at night and it goes on smoothly, never irritates my eyes and sinks in quickly! I'm so happy this was included, as I believe this is quite expensive. Great company that is into being as natural as possible- points in my book! 5. Maybelline Age Rewind concealer- I've reviewed this recently so won't go too much into it again. Love this and how it doesn't crease under my eyes. The sponge applicator makes it quick and easy too! 6. Jemma Kidd On Set Mattifying Powder (Mid-Dark)- found this in the Target Clearance section for $6 (original price I believe is $22?). This reminds me of my beloved MAC Studio Fix powder foundation! I apply with a duo fibre brush for a light coverage look. Too much and it can look a bit cakey. I always have this around to blot any oil in my t-zone. I've hit pan and as soon as this is done I'll be repurchasing Maybelline Dream matte powder! 7. Orly Gumdrop- this tiny gem was $3 and I love it! The color is gorgeous and perfect for summer! It's a perfect pastel mint green. I've worn this several times this month on my toes and fingers, and always get compliments! Orly is a great brand and I love the minis- its quite hard to finish up a polish (at least for me- turns thick and has to be tossed). 8. Benefit They're Real mascara (mini size)- As much as I love my Cover girl mascaras (Lash Blast and Super Lash) they tend to smudge often, so I've been going back to this mascara. This makes my lashes long and luscious;) but my lashes need volume! Either way am falling in love with this for summer lashes! Does anyone have any faves I should have a look at? I'm always looking to add to my beauty wish list! Thanks, I def have a look at your blog. I need a new concealer so must try this one and read your full review! Really!? I would have been stocking up in France! I'm glad we get tiny bits of their products here- but can't imagine how much more there is in the French pharmacies I've read about! I love favorites! Thank you for sharing. Thanks:) will be checking your faves out now! 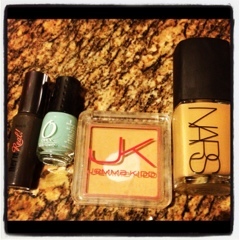 The concealer is one item I can't leave out, I have a terrible dark under eye area!